We all celebrate Thanksgiving in different ways and with different foods. But the one thing that’s guaranteed to be on almost every table this holiday is wine. 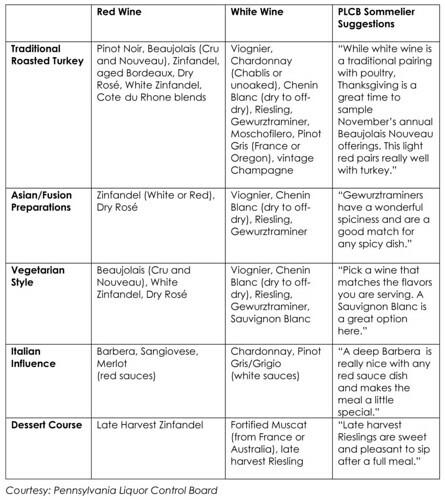 The PLCB created a wine pairing chart to help with your wine selection. Although the chart is helpful in identifying which varietals will work with your meal, it doesn’t recommend specific wines. If you’re like most people, you’ve put off your Thanksgiving wine purchases until the last minute. And when you finally arrive at the PLCB store, you probably won’t have time to browse the aisles let alone decode a chart. You need specific recommendations and you need them fast. Look no further. 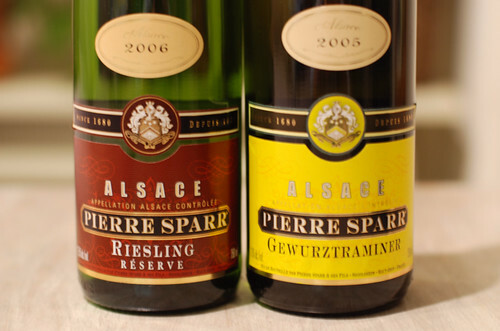 2006 Pierre Sparr Riesling Reserve (PLCB No. 22105, $14.99). A well-balanced Riesling; not a cloyingly sweet sugar-bomb. Bone dry, as Alsatian Riesling should be. Apples, pears, steely acids and a hint of spice on the finish. 2005 Pierre Sparr Gewurztraminer (PLCB No. 21762, $12.99). Low acids and glycerol give this medium-bodied wine its characteristic sweetness. Lychee, grapefruit and dried apricots on the nose. Similar flavors on the palate, and a touch of spice at the end. 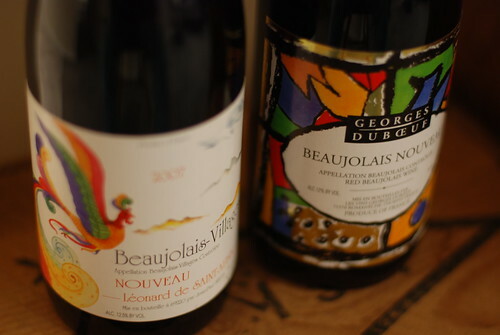 2007 Georges Duboeuf Beaujolais Nouveau (PLCB No. 5877, $11.99) and 2007 Leonard de St.-Aubin Beaujolais Nouveau (PLCB No. 8998, $11.99). You expect Beaujolais Nouveau to be fruit forward. This year’s crop is different. The fruit is incredibly subdued, which exposes more of the wine’s acidity. And that’s not necessarily a good thing in such a light-bodied red. You’re left with unripe sour cherry, tart cranberry, somewhat bitter undertones and an almost slightly medicinal aroma. This is true of both of the Beaujolais Nouveau. I’d pass on the Beaujolais Nouveau this year. But if you have to choose between the two, go with the Duboeuf over the St.-Aubin because the Duboeuf has a little more fruit to grab onto. 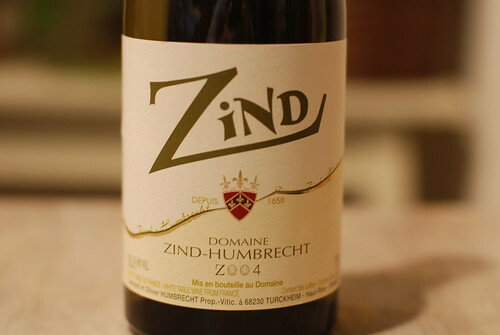 2004 Domaine Zind-Humbrecht Zind (PLCB No. 21229, $18.99). Consider this as an alternative to Riesling and Gewurztraminer. This white from Alsace is focused and expressive. It’s made with 70% Chardonnay and 30% Auxerrois, an Alsatian varietal that adds substance and nuance. Floral and citrus flavors decorate the palate. It has a rich mouthfeel but the finish is crisp and bright. Seductive honeysuckle notes linger for minutes. Georges Duboeuf Morgon Jean Descombes (PLCB No. 5504, $15.99). Consider this wine instead of the Beaujolais Nouveau. Although Morgon is made with same grape used in Beaujolais Nouveau, the Gamay grape, it has a little more depth. Sweet cherries and mocha with mineral undertones. 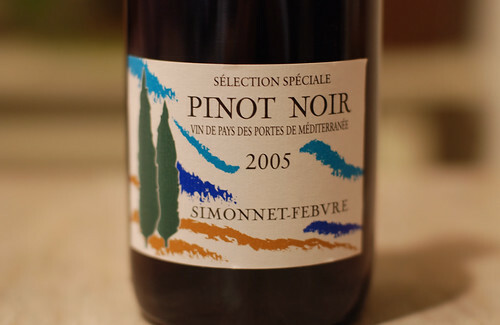 2005 Simonnet-Febvre Pinot Noir Vin de Pays des Portes de la Méditerranée (PLCB No. 18853, $8.99). Burgundy and Old World-style Pinot Noir are stellar wines to pair with a roasted turkey because they deliver earth and fruit flavors that perfectly complement your typical Thanksgiving spread. However, the problem in PA is that (a) all of the Burgundy on the PLCB stores’ shelves is pretty pricey; and (b) most of the Pinot Noir is not only pricey, but it’s New World-style. To get a drinkable Pinot (New or Old World), you normally have to shell out at least $40. Then there’s the Simonnet-Febvre Pinot Noir, which clocks in at an almost laughably low $8.99. This isn’t an elegant Pinot Noir you’ll get misty about a la Sideways. But it does have the barebones framework of an Old World-style Pinot Noir. A shocking effort for the price. 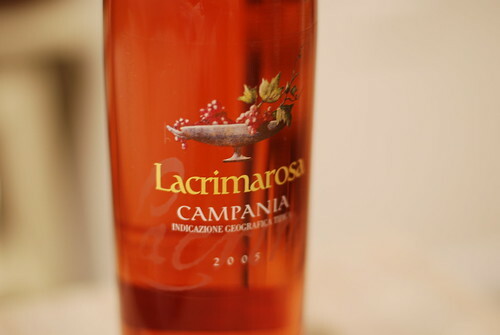 2005 Lacrimarosa Campania Rosé Mastroberardino I.G.T. (PLCB No. 25333, $12.99). Made from the Aglianico grape, this Rosé displays delicate strawberry and raspberry fruit supported by an ashy minerality that's blended with a slight creaminess. Lime and citrus notes brighten the finish. 2003 Cantina Zaccagnini Montepulciano d’Abruzzo Riserva (PLCB No. 4560, $11.99). For those who are fans of Pulp Fiction, consider this the Winston Wolfe of wines: it solves problems. This red wine is not the most intuitive match for a Thanksgiving meal, I’ll admit. But it’s versatile enough to save the day. The fruit, tannins and acidity are well balanced, and it’s guaranteed to go with something on the table. A consistent crowd pleaser, and my current house wine. It’s tempting to make certain assumptions about a restaurant named Cochon (French for pig): (1) the menu will contain pork; and (2) the food will compel you to eat to the point of gluttony. Both of these assumptions, it turns out, are true of the new Queen Village French bistro helmed by chef Gene Giuffi and his wife Amy. But when this duo was mulling over names for their BYOB, they settled on Cochon for an entirely different reason. Cochon is the latest crusader in the city’s French restaurant revolution—a liberating development in light of Philadelphia’s time-worn allegiance to the Italian BYOB. The bistro occupies the space that formerly housed Café Sud. During renovations, Gene and Amy discovered charming fixtures almost too good to be true—a well-heeled mosaic tile floor and original pressed tin wall panels that have been sanded and painted powder blue. The warm, expanded dining room now comfortably seats 44 at humble wooden tables. The gleaming new open kitchen is nestled into the corner. A large chalkboard decorates the wall to display daily specials. Though young, Cochon already has a clear identity, all thanks to the pig. To chef Giuffi (formerly of Davio’s, Nan, La Boheme and ¡Pasión! ), the pig represents the essence of rustic, farmhouse food. And he named his bistro after the uncultured sow to remove the pretense often associated with French fare. It’s a proud, unapologetic reminder—this is peasant food. But don’t let the rural theme fool you. 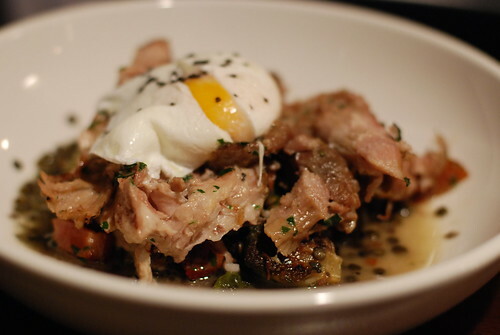 Cochon’s food may be simple, but it’s not without sophistication. 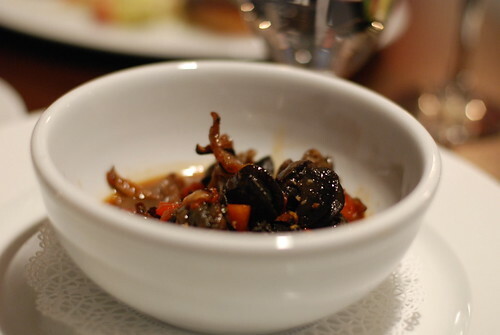 Clean and tender escargot and Shitake mushrooms rest in a red wine sauce. Gently kissed with garlic Pernod butter, the deep, herbaceous sauce is ambrosial, making this one of the most memorable and satisfying appetizers on the menu. Another must have is the crispy chicken livers appetizer—a Davio’s dish Giuffi updated. 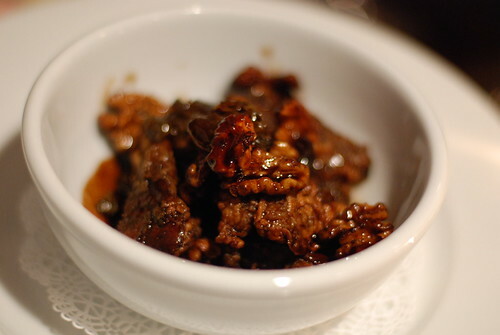 Tossed with balsamic, candied walnuts and raisins, the livers are soft, rich and pleasantly sweet. 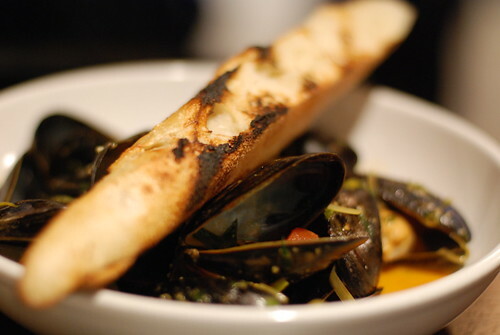 The delicate tomato-leek saffron broth in which the mussels bathe could use a touch of heat. Still, you won’t be able to resist dredging the bowl with a spent shell to rescue the last drop of broth. Entrées, too, are smart without losing their pastoral appeal. 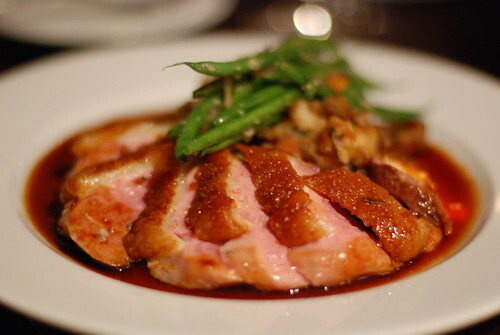 Beautifully prepared duck breast comes with a white bean ragout that includes crisped-up bacon and confit, a creative play on refried beans. Giuffi skillfully prepares a Prime cut of Belevedere strip steak for the steak frites, and the fries conceal a faint hint of heat that warms the back of your throat. Slow-cooked country staples receive the tender care they deserve. The pork shoulder marinates for almost 2 days and roasts for 8-10 hours. It’s a comforting prelude to winter, though the dish could use more of the roasted Brussels sprouts that are nesting in the hearty and flavorful lentils du Puy. But the braised, free-range lamb shank steals the show. The sweet, wild meat spills off the mammoth bone with the slightest brush from a fork. 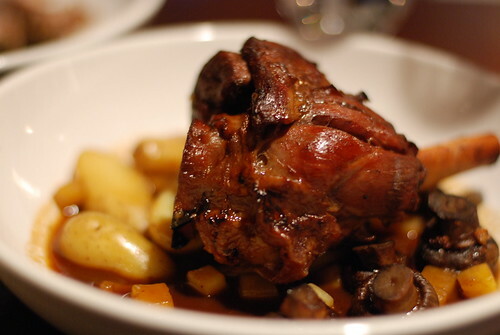 And the syrupy port reduction that hosts earthy rutabaga and fingerlings balances the lamb’s richness. Chateauneuf-du-Pape and Bordeaux are ideal for Giuffi’s cuisine, though the selection of these wines at the nearby 5th street PLCB store is thin and/or expensive. In a pinch, the 2003 Chateau Greysac will do (PLCB No. 4453, $18.95), as will the 2003 Chateau Les Fief de Lagrange (PLCB No. 7991, $18.99). But those searching for a less expensive alternative may enjoy the 2005 Crios de Susana Balbo Mendoza (PLCB No. 29021, $11.99), a Syrah/Bonarda blend (think: Merlot with a personality). Cochon’s key strength, ironically, highlights a small weakness. Giuffi’s signature sauces are intensely addictive and beg to be soaked up with a deep, never-ending basket of sliced baguette. 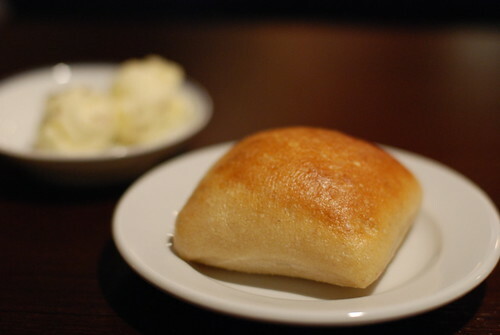 But the single, elegant roll you receive instead doesn’t last long (especially with the delicious butter dressed with sea salt) and even seems a little too fussy for Cochon’s humble personality. 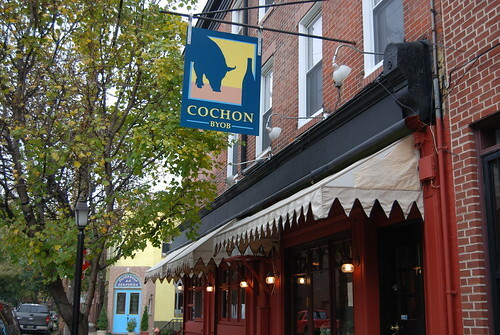 But Cochon’s only real blemish—one that’s common in Center City eateries—is the relatively high noise level. The angular dining space and tin panels are likely more to blame than the open kitchen. Most desserts are currently being sourced from outside vendors. 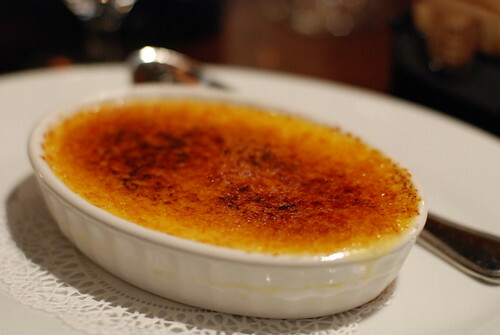 But the creme brulée, made in-house, is a flawless dream that should not be missed. Its hard, caramelized shell harbors a cool, satisfying custard. With its warm environs and rustic country cuisine, Cochon’s a bistro the everyday Frenchman would call home. For more pics, check out my Cochon set on Flickr.